Home > Small, silly, and active birds, no wonder they're popular! Small, silly, and active birds, no wonder they're popular! These little guys are the clowns of the parrot world! Their acrobatic skills always amaze me and my children. They are generally friendly birds that like to be around others and don't seem to mind meeting new people which isn't common with many parrot species. Green Cheeks have busy little personalities and are almost always in action. They are more than comfortable hanging upside down and will use every toy offered to them. They do have talking abilities but aren't that loud of a parrot and they are small which makes them ideal companions. They do still have that famous or shall I say infamous conure call (sounds similar to a hawk shrieking lol) but it isn't often used. They are known to be the quietest of all the conure species and that I can say is true. 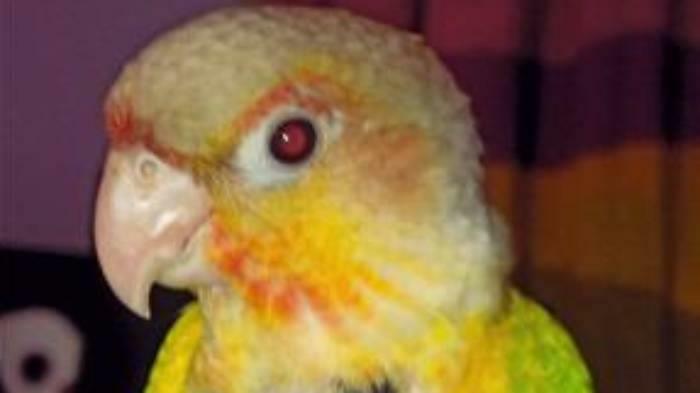 Most conures will drive you crazy with their calls and this is not the case with Green Cheeks thankfully. Green cheeks have a varied diet and will usually try new foods with no problems which also isn't common in parrots. They originate from the rain forest and these birds love to bathe. I like to keep my birds fully flighted and our little guy loves to take advantage of this, flying around the house all the time. He can get a little nippy when its time to go inside the cage but being he is so small he cant do much damage. I find that our Lotus is so busy he never seems to have time for cuddling though however that may change as he gets older. All together I think this species would be suitable for a variety of environments and families. They aren't as needy as some species and make great family birds because they are willing to accept a large "flock" of family members which is refreshing in the parrot world (most parrots are one people birds looking for a mate, not necessarily a flock).